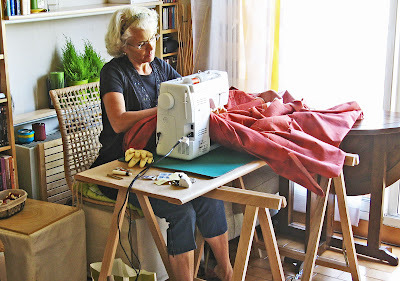 Living in a very tiny one bedroom apartment, without air conditioning, in temperatures that make flip flops too hot to wear, presents some interesting challenges, particularly (for myself) when making a large quilt. The size of this tablecloth is 104" x 64". For this reason, I sandwiched, basted and quilted only the actual size of the table top (82" x 42") on the first go-round, then added the borders once the centre section was completed. Constructing the centre of the quilt in this way worked very well; there was smaller layout space required and less bulk to fit into the machine. When it came time to add the borders, I did encounter difficulty in the sandwiching and basting process, because at this stage, the quilt was full size, and our apartment had not grown. Having squared up the centre section, it was possible to sandwich and baste one side at a time, keeping the fabrics taut. This is certainly not a preferable method of quilt construction, and I would not recommend it to anyone, however, it can be done. "Where there's a will there's a way!". The actual sewing station was another challenge. My husband, an architect who has always promoted resource efficiency, embraced this challenge enthusiastically and creatively. With 2 saw horses, a sturdy wooden slab, some movable furniture cubes, and a 40" diameter dining room table (that collapses to 6"), I had a sewing space that accomodated this project, and furniture that neatly collapses to a very managable size for storage. Although there will be some refinements required (as in a wooden slab that completely covers the saw horses) for the next time, this temporary sewing station allowed me to complete the project.